I took the center photo with my IPhone on Burst Mode using 10 images stacked together of a sago palm looking into the center. The image on the left is the original photo converted to black and white followed by an added layer set to COLOR blend mode and a gradient applied. COLOR blend mode lays the color on top of your image but not as a solid, so you can see the details through the color. The image on the right is the original image with an added layer and gradient set to MULTIPLY which darkens the colors. 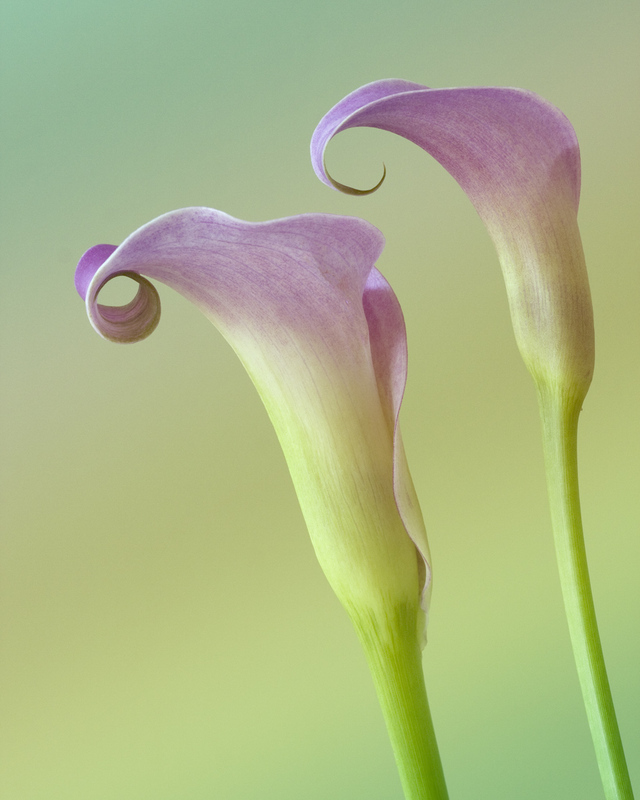 These callas were so beautiful… one of my favorite flowers though it is hard to pick a favorite. I love the graceful lines of these two and arranged them to show off their profiles. The original background was a plain green wall… a plain background is really important for this next step. Add a new layer, then go to the Gradient tool in Photoshop and pick a nice blend of colors, or design your own color stops. Generally I like the linear gradient for this effect (first one on the left). Pull your cursor at a diagonal on the blank layer… and voila… well actually not yet.. all you will see is the gradient. Lower the opacity of that layer to around 50% for starters and go through your blend modes… usually Multiply, Overlay and Soft Light are the best options. Depending on the colors in your image… and the colors in the gradient.. you will get different blends.